My theme was Moonflower. 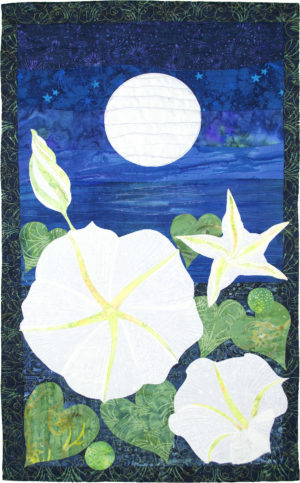 I love depicting nature in my quilts. I find the endless combinations of colors and shapes nature inspiring. The moonflower is the name for several night-blooming plants; I’ve chosen the one that that most people are familiar with; a large white flower related to the morning glory. It goes from a closed bud to a full flower in the course of an evening. The shapes are just beautiful. And when the sun comes up, it closes again. I love the round spiky seed pods and the heart shaped leaves. I read a poem by F.T. Prince entitled The Moon-Flower that evoked the sea, too, so decided that the sea and the moonlight would be the setting for my Moonflower. Fused and machine appliqued and quilted. Cotton fabrics and silver lame for the moon.